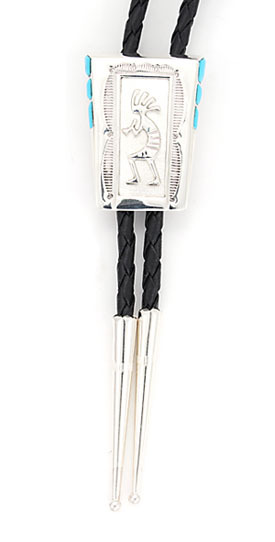 This bolo tie has a kokopelli and stamping with 3 turquoise stones inlaid on each side. Kokopelli piece measures approximately 1 3/8" long by 7/8" wide at its widest point and is made out of sterling silver. It has vinyl bolo straps measuring approximately 44'' long end to end with sterling silver tips. Made by Navajo artisan Leonard Jim. Stamping may vary. Color shade of turquoise may vary as well.